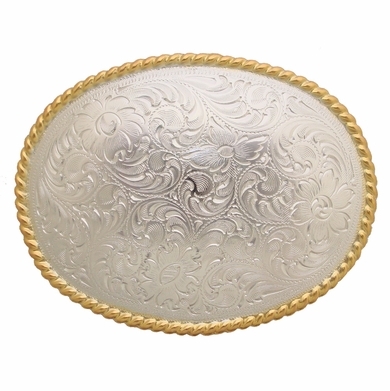 Intricately detailed Floral Engraved pattern on the sterling plate rope edged belt buckle. Buckle Size: 3 1/2" long, 2 5/8" wide. Shiny Gold on shiny Sterling Silver finish. Fits 1 1/2" wide belts.